Below you fill find all funeral homes and cemeteries in or near Coffeyville. 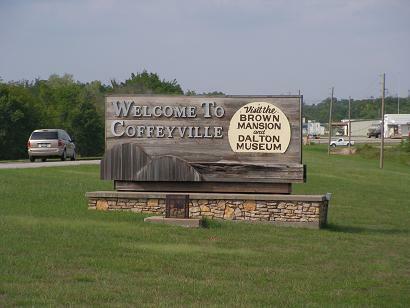 Coffeyville is also known as: Montgomery County / Coffeyville city. Their current mayor is Mayor Jim Faulkner. Zip codes in the city: 67337. Coffeyville has been featured in films like: Bunker Hill (2008). Some of the notable people born here have been: Trevor Murdoch (wrestler), Cynthia Sikes (actor), Russ McGinnis (baseball player), Jeff Leiker (coach), Phil Ehart (musician and drummer), James Grauerholz (editor and writer), and Ryan S. Jones (film producer and film editor). It was noted on November 2nd, 2018 that James Lee Chance passed away in Clearwater, Florida. Chance was 89 years old and was born in Coffeyville, KS. Send flowers to share your condolences and honor James Lee's life. It was reported by The Advocate on October 2nd, 2018 that Betty Lou Colling (Robb) passed on in Newark, Ohio. Ms. Colling was 92 years old and was born in Coffeyville, KS. Send flowers to express your sympathy and honor Betty Lou's life. It was noted on April 10th, 2018 that Alice "Darlene" Chance passed on in Florida. Chance was 87 years old and was born in Coffeyville, KS. Send flowers to share your condolences and honor Alice "Darlene"'s life. It was noted by South West Times Record on March 22nd, 2018 that Suzanne Tongier (Stewart) perished in Ft Smith, Arkansas. Ms. Tongier was 70 years old and was born in Coffeyville, KS. Send flowers to share your condolences and honor Suzanne's life. It was revealed by The News Tribune on September 19th, 2017 that Margie Nebeker-Lackey (Hite) died in Washington. Ms. Nebeker-Lackey was 94 years old and was born in Coffeyville, KS. Send flowers to share your condolences and honor Margie's life. It was noted by South West Times Record on January 28th, 2017 that Sandra Lee Smith (Smith) passed away in Ft Smith, Arkansas. Ms. Smith was 60 years old and was born in Coffeyville, KS. Send flowers to express your sorrow and honor Sandra Lee's life. It was revealed on January 24th, 2017 that Nancy Jo Farley (Hollabaugh) perished in Montgomery, Ohio. Ms. Farley was 86 years old and was born in Coffeyville, KS. Send flowers to express your sympathy and honor Nancy Jo's life. It was revealed by Daily Hampshire Gazette on January 19th, 2017 that Norma June "June" Thibodo (McBride) died in Florence, Massachusetts. Ms. Thibodo was 88 years old and was born in Coffeyville, KS. Send flowers to express your sorrow and honor Norma June "June"'s life. It was noted by Daily Hampshire Gazette on January 18th, 2017 that Norma June Thibodo (McBride) passed away in Leeds, Massachusetts. Ms. Thibodo was 88 years old and was born in Coffeyville, KS. Send flowers to express your sympathy and honor Norma June's life. It was written by Greeley Tribune on December 10th, 2016 that Jacob Austin Fritz perished in Colorado. Fritz was 22 years old and was born in Coffeyville, KS. Send flowers to share your condolences and honor Jacob Austin's life. 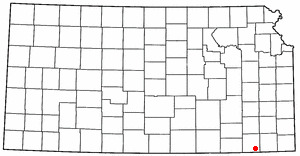 Coffeyville is a city situated along the Verdigris River in the southeastern part of Montgomery County, Kansas County, located in Southeast Kansas, in the Central United States. July 3, 2007 the city lost its supply of potable water, but the water service has been restored and the order to boil water was rescinded on July 7. Blanton, was dispatched to lay out the town. On July 1, 2007, Coffeyville had a major flood in which the local refinery, Coffeyville Resources LLC, had an oil leak which polluted the water. With the arrival of the railroad, a young surveyor, Napoleon B.
David W. Barnes Funeral Home A Name You Know, A Name You Trust! Independently owned and operated by David and Carol Barnes of Coffeyville, Kansas. Listing all funeral homes in Coffeyville, Kansas so you can easily send flowers to any location (same day delivery) or find any funeral service. Here is a list of Coffeyville funerals and memorials providers. We work with local florists and flower shops to offer same day delivery. You will find budget sympathy flowers in Coffeyville here. Our funeral flowers are cheap in price but not in value.